Frank started his professional life as a mediocre radio personality, constantly getting fired by general manager after general manager. Fortunately, it was steady work as the only people fired more often than Frank were his (ex) general managers. Scot and Ted found Frank sleeping on a park bench late one night and invited him in for a beer. He proceeded to drain their reserve of two half kegs. It was the first time he had had beer. The two immediately noticed Frank’s strange reaction to beer, and, as they soon discovered, to alcohol in general – it sobered him up. This was to be his normal reaction during the entirety of The Roommates’ existence. It came in very handy for Scot and Ted, allowing them to party beyond their wildest dreams in full confidence that Frank would get them safely home. There was another odd thing about Frank. Though he was born in the industrial slums of the Midwest, he had a remarkably British accent. He picked up the dialogue while studying at Oxford as a Rhodes Scholar. The truly interesting thing about the accent, though, was it was not of the haughty academic variety. It stank of the working-class mannerisms of the harbor towns. Still, it was a novelty and certainly figured in the success of The Roommates. There was a final idiosyncrasy which let Frank stand out from his fellow band members. 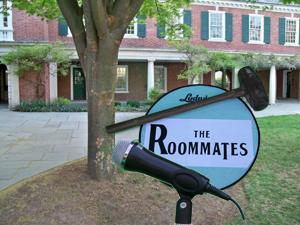 Unlike the others, he came into The Roommates without a rap sheet. This trait allowed him to slip into establishment places unnoticed and barter for various items. He had the unique ability to sell any idea or thing to anyone, and all in an acutely legal manner. He was also a master of disguise. There is a story, never confirmed, that the boys once decided to go to Atlantic City for a short gambling spree but were short on cash. Frank, allegedly, dressed as a homeless man and went for, what he has said to have called, a “Sunday stroll.” He convinced a number of ministers to allow him to ask their respective congregations for loans from the churches’ treasuries. Counting on some big wins at the blackjack tables, he also promised them a return of 14%. After getting a rent-a-car for free, (“It’s for a worthy cause,” Frank supposedly told the dealer), the group and a few friends drove to Atlantic City, stopping only briefly in Manhattan for an early lunch. They had a total of $10,000. When they rolled up to the Tropicana, some old man told them to play the slots. They lost it all in three-and-a-half minutes and drove back the same day, stopping only for a short time again in Manhattan for an early dinner. The next Sunday, Frank, dressed in a tux and driving a newly purchased classic Mustang, promptly returned all the money plus 16%. It turned out, while his other Atlantic City fellow travelers thought he was in the washroom during their New York lunch, he took half the money the church-goers had given him and sold short. Within a matter of hours, he had tripled that investment. Frank qualified the actions of The Roommates by claiming, in the Zig Jones interview, “I’m not into mutilation myself.” However, when asked his favorite music, he responded with “Death music, organ music, the kind they play at wakes, although for my own wake I’d prefer to hear the entire Sgt. Pepper album.” These two quotes reveal the growing dichotomy of Frank’s character as he matured with The Roommates. While the first indicates his initial straight-laced persona, the latter hints of things to come, and in a quite tragically ironic sense. Indeed, when he obtained the license plate for his pony car, he made sure it came with the letters “ATK” in it. He explained to those interested (or sympathetic) enough to listen, it mean The Roommates would forever remain on the attack. The unraveling of Frank, to the point where he became the only member of the band not to turn conventional after the break-up, is said to have been his on-again off-again romance with Lydia Lunch – the famous punk songstress/actress. In fact, it is now known that it was his despondency over this relationship that led him to take that ride from L.A. to Vegas on that fateful night of November 1, 1983.